“ The latest developments in the story of Parliament House (see previous blog) are as follows. Scottish Green Party Councillor Gavin Corbett has had meetings with senior officials in the Council and shares his thoughts here. The Leader and Deputy Leader of the Council (Andrew Burns and Steve Cardownie) have tabled an urgent motion for the Corporate Policy and Strategy Committee on 24 February 2015. It will require to be ruled urgent by the Convener if it is to be considered. The full text can be read here. it concludes by recommending that the Chief Executive of the COuncil writes to the Scottish Government Permanent Secretary to seek a voluntary resolution of the issue. There is quite a bit of interest in this motion. Under item 5, the Committee is invited to note that in June 2008 it was resolved that a review of common good would only be carried out if and when property was being sold. The motion omits to mention, however, that the question of Parliament House had already been raised in my report of April 2006 in which I asserted that Parliament House should have been included in a list of common good assets that had been supplied to me in 2005. The Council’s responded by preparing a Review of the Common Good for a meeting of the Resource Management and Audit Scrutiny Committee on 12 October 2006 in which, under the heading “Parliament House/The Old Royal High School”, it said nothing about Parliament House but narrated the history of the High School (click here for relevant extract). “It should be noted that Parliament House and the Old Royal High School, as listed on page 3 of my October Report are not the same. Parliament House is located off Parliament Square opposite the City Chambers. The Old Royal High School is on Regent Road. “Then I waited. I looked at the agenda for the 12 October meeting but there was no mention of the Common Good Review. Likewise, at the next meeting on 16 November, there was no mention of the issue. What had happened? Why had the Review of Common Good in Edinburgh not been tabled? I never did find out. But in December, a paper was tabled at the Executive of the Council which says nothing about the investigations reported in the October 2006 review. Then in January 2008, a further Review was published which this time contained exactly the same wording under the heading “Parliament House/The Old Royal High School” and said precisely nothing about Parliament House. We now know from item 1 in the motion tabled today that the Council knew in April 2006 that Parliament House (in its mistaken view) did not form part of the common good and was not owned by the City. My report was tabled in April 2006 So why, in 2006 and 2008, did the Council not divulge that Parliament House was not (in its view) owned by the City and, instead, stay silent on the matter? DId they know and rather not admit it? Given that Scottish Ministers had no prior title to Parliament House, it would have been normal practice for the Keeper of the Registers of Scotland to have withheld indemnity for that part. In other words, the Keeper would say, “maybe you (Scottish Ministers) do indeed own it but I am not satisfied that there is sufficient evidence“. 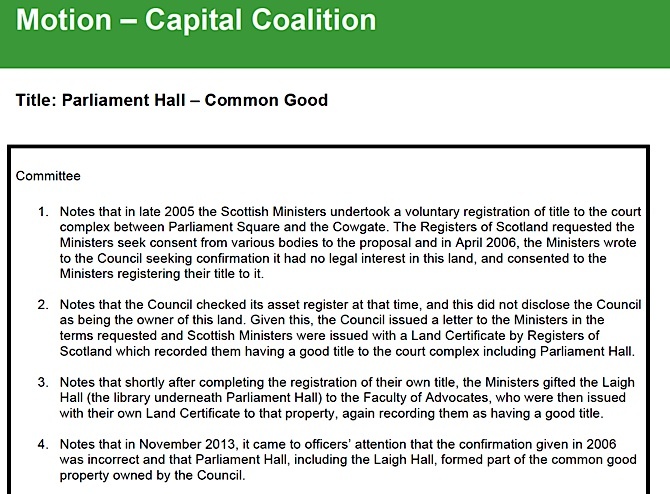 The state guarantee granted in the Land Register would have been withheld and the title would have been open to challenge by the true owner (City of Edinburgh Council) for ten years i.e. until November 2015. Why did the Keeper not withhold indemnity? I asked the Registers of Scotland this question today and they provided the following statement. Looking on the bright side, at least the Faculty of Advocates seem likely to maintain it properly, and to use it for its historic purpose, and unlikely to flog it off for a luxury hotel. Yes, sadly, one dreads to think what City of Edinburgh Council could do to it if they have title. It is better off belonging to the nation and not the City of Edinburgh. But as Common Good should the Faculty of Advocates not pay rent to. C.G. fund? I wonder how much the confusion over Parliament House/ Royal High School has played a part in this guddle? It is my experience that rather than admit to an honest mistake, too many people will tie themselves in knots. In his blog, Councillor Corbett talks of the Scottish Courts Service leasing PH from the common good account with any surplus income received going towards upkeep of other common good assets like the Meadows or Calton Hill. Surely he can’t imagine the SCS is going to pay the Council for the privilege of maintaining their (the Council’s) building! Even a settlement consisting of title to PH being restored to the Council and they then lease it SCS for 175 years (statutory maximum lease) at a peppercorn rent in return for the quid pro quo that SCS pays for its upkeep is not totally risk free for the Council. Apart from being mere ownership for ownership’s sake (something usually deplored on this blog whether it’s dukes and earls retaining great estates at little or no profit (allegedly) for the sake of passing on intact to the next generation or Highland Titles with 1 foot square plots), there is the ongoing admin etc. costs (not much in the great scheme of things, admittedly) of maintaining it on their books. There’s also the threat of introduction of LVT – PH presumably has a massive locational value and the Council as owner and landlord would have to pay that for a building it derives no benefit from. The story here is, of course, the failings in the decision making process (or lack of it) and hint of a cover up but the end result – the building belonging to the SCS – is the right one. It’s a win-win for the people of Edinburgh in that they still get to enjoy PH but the people of Glasgow (and Birmingham!) are paying for it. I hope the Councillors will act accordingly. Do we know what happened at the Council meeting on Tuesday? I’m guessing from the lack of media coverage that the motion wasn’t allowed to be heard.